many more books.She has been a pillar of strength to me and I believe she will continue to support me in doing the Lord’s work truthfully.I pray that the Lord may continue to use her in His own wonderful way.If you have been blessed by this book, please write to me or the authoress at our church address given below. May God bless you. Yours in the Lord’s service. “For, behold, the darkness shall cover the earth, and gross darkness the people: but the LORD shall arise upon thee, and his glory shall be seen upon thee.”Isa 60:2Our God made the light to shine out of the darkness. Our Lord is the one who created the sun, moon and stars in the universe. He is the maker of light. He is the King of Glory.The bible says in Gen 1:3,4, “And God said, Let there be light: and there was light. And God saw the light, that it was good: and God divided the light from the darkness.” Today, we see the people of this world groping in darkness. Sin brings darkness in the lives of people. The people are bound by this darkness and their suffering increases.Sickness is a kind of darkness in man’s life, which ultimately leads to death. Problems, division in families and various other things are a kind of darkness in men’s lives today. People are struggling like worms today in sin.Look at Jesus Christ, who brings light in our dark life. The bible says about Him in 1 John 1:9, “If we confess our sins, he is faithful and just to forgive us our sins, and to cleanse us from all unrighteousness.” Children of God is the light of God in you today ? He brought us out of darkness to preach the gospel without fear.Apostle Peter writes in 1 Pet. 2:9, “But ye are a chosen generation, a royal priesthood, an holy nation, a peculiar people; that ye should shew forth the praises of him who hath called you out of darkness into his marvellous light.”My beloved brothers and Sisters, no man can give the true light in your life except the Lord Jesus Christ. Look at David who asks the Lord to lighten up His life. Ps 18:28, “For thou wilt light my candle: the LORD my God will enlighten my darkness.”Yes, Beloved brothers and sisters I would like to share the miracles, experiences and happiness in my life through Jesus Christ, who brought me from darkness to light. With the help and encouragement of my good God I am writing this book. All experiences shared in this book are true. I was born on 2nd June, 1954 in Kaval Kinaru village, in the state of Tamil Nadu, to a Catholic mother and Hindu father in a family of 5 children, i.e 2 brothers and 2 sisters and me. I was the third and was named as Saroja. I completed my schooling in my village through a Protestant school. At the age of 19 in 1973 I was married into a Hindu family and came and settled in Mumbai till date. Until the year 1993, I lived a life of a sinner and according to the worldly ways. Towards the end of 1993, I was not aware that there is going to be a drastic change from darkness to light in my life.Earlier in the year 1990, some missionary Sisters had visited my house and spoke to me about the Lord Jesus, about His life and the miracles He had done. They also gifted me a Holy Bible which I kept in my cupboard without even opening it and not realising that this book would become the most important possession of my life in future.Then in the year 1993 my husband, son, daughter and myself went to our native place to spend our vacation. There as usual we went to visit the Tiruchendur temple in Tirunelvelli district. According to the temple’s tradition, we have to break a coconut at the entrance first and then enter the temple. When my husband broke the coconut, an exact half of the coconut just flew away crossing the high compound wall. We tried searching the half coconut which was flung outside but could not find it. Since this was the first time this had happened, we asked the pujaris who were present the reason for it. The pujaris were surprised because such a thing had never happened before and said that it could be a bad sign. But dear brothers and sisters little did I know that from that day onwards I was beginning to enter a new life with Jesus Christ and He had already chosen me and there was nothing which could stop me from following Him. Jabse pyara, Yeshu ayaMera Jeevan badal badal gayaJabse maine, usey hai payaMera Jeevan badal badal gaya.Muje gum aur, musibatomeSahara dekar, sahara dekarMera paponka, bhoj lekharApne upar, Apne uparKrus par khoon, apna bahayaMera Jeevan badal badal gaya.Is jahaki, gandagi seMuje chudaya, muje chudayaAag dekar, muje gunahoseHai bachaya, hai bachayaTabse dil mera, man meri khayaMera jeevan badal badal gayaMuje kharida hai MasihaneKhoon deke, khoon dekeMai hun uksa, mera na koyeeSivay uske, sivay uskePutrane hai Pita se milayaMera Jeevan badal badal gaya.Mere rahon me na khateAb rahenge, ab rahenge,Meri manzil, me bhi matam,Ab na honge, ab na hongeHogayi hai dur, mautki sayaMera Jeevan badal badal gaya.Rath kali beeth gaye haiHuva Savera, huva saveraSubha ka tara, dekho chamkaYeshu Mera, Yeshu MeraIsliye maine yeh geet gaya, Mera Jeevan badal badal gaya. As I read this verse, a strong urge rose within me to read the whole chapter. And I read verses 1 through 35, after which I was not able to read any further. I began to weep with tears in my eyes. I wondered why I was weeping. I continued to weep for about 20 minutes. But after this I felt all my burden disappear and I felt light in my heart. Then I began to read the bible from the beginning chapters. After this I started attending the healing service every Saturday. My dear brothers and sisters, all the allergy that I had on my body slowly started disappearing. I was very happy and rejoicing in my heart praising my Lord with all my being. I started to read the bible where I learnt about the commandments of the Lord. I began to try to keep and obey the commandments of the Lord. But my dear brothers and Sisters, the evil one was not happy with me. At my home, my husband started arguing with me saying, “You have become alright now, forget about that place.” But only I myself could understand the gladness that had entered my heart. Not wanting to loose this joy, I tried to explain to him, because I did not want to return to the sinful life. He did not agree.Gradually, after my husband would go for shift duties, I would come to the prayer meeting without his knowledge. Finally he came to know that I was continuing to attend the prayer meeting. And one day he raised his voice and started quarrelling with me. Then I withdrew alone by myself and cried out to the Lord with a loud voice and prayed to the Lord saying, “What should I do O Lord?” And I opened the bible and I read this verse, Ps. 30:11 “Thou hast turned for me my mourning into dancing: thou hast put off my sackcloth, and girded me with gladness.” After reading this verse, I decided in my heart that whatever problems may arise, I will not forget this good Lord who healed me and changed my heart. I immediately forgot all the problems that occurred at my house that night and slept peacefully. My dear brothers and Sisters, the very next morning my Lord did a marvellous thing in my life. My daughter Padma suddenly said to me, “Mummy you are not alone, I also will join you in attending this prayer meeting.” When I heard this I could not express the joy that filled my heart. Because of this I was more strengthened in faith. At that very moment I remembered about the incident that took place at the temple in my native place. I remembered the coconut that broke into half and that half was not to be found. My daughter and I talked about this and discussed that the evil one already knew that half of our family would be out of his hands. Both of us together started attending the prayer meetings regularly. Padma passed with a good percentage in her final year and even before her results were out, the Lord blessed her with a good job. In the meetings in which Bro.Godwin prayed many were filled with the Holy Spirit. The evil spirits were also getting restless in this place. Many people received their healings. Witnessing all these things a thirst to be filled by the Holy Spirit also grew in my heart. Every prayer meeting day I will pray intensely for the anointing. Many times I felt in my heart that today I would receive the Holy Spirit, but nothing happened. Then I became very sorrowful because even after praying for many days I was not empowered by the Holy Spirit.After some days during the close of the meeting when all the people stood up for prayers, Bro.Godwin would call out saying that whoever wants to receive the Holy Spirit cry out and ask the Lord Jesus Christ. As already I had kept this request in my heart before the Lord, that day I was determined to receive the anointing. I began to pray all the more intensely. At that moment I felt a strong vibration coming over my body. And I began shaking from head to toe. I could not stand and I slumped to the floor. When I would get up to my feet I would not know anything. Many weeks this same incident continued. But I would be filled with overflowing bliss and joy in my heart.Gradually during the prayers, my lips also would start murmuring some words. Many times I would try to control my self. During these times I would be right at the back of the crowd, of the many people who would attend the meetings. Seeing me struggle like this always, the people who stood at the back row asked me to go forward and stand ahead near the front row. Many people persisted that I go forward and stand. According to their advise, the next time I took my seat in the front row.During that time, Sis.Ida would speak out loud as the Lord was speaking. And I would hear people say, “Yes Lord, Yes Lord !” Many times I heard Bro.Godwin mention that the Lord had entered this place through Sis.Ida. Yes, maybe the Lord had entered in through her, but I had begun coming to this place after about 7-8 years and I also thought that this is true. At that time Sis.Ida and also some other brothers and Sisters would also speak. But after I began to come and whenever I would hear them speak, I would experience some strange things. As I heard them speak, some words would just come out of my mouth. But I did not understand this strange language. Yes, but I very well understood that these ‘tongues’ were speaking out words against the brothers and Sisters who were speaking at that time. After the meeting I would never utter anything to anybody because Sis. Ida was Bro. Godwin’s wife. Finally, one day being filled with the Holy Spirit, I went out of my consciousness and spoke some words. I did not know what I spoke. After returning back to my senses, I could see Sis.Ida speaking something In Bro.Godwin’s ears. Bro.Godwin being a good servant of the Lord, but having no knowledge, listened to the voice of his wife and laid his hand on my head and started binding me. But my brothers and Sisters, no one could control the power of the Lord’s Holy Spirit within me. There are many things that I can write concerning these things but I do not want to hurt anyone’s feelings. Because of this incident, I would be very grieved in my heart, but deep within, my heart always carried great peace and joy. During the end of the year 1994, an open air meeting was arranged by the ministry at Borivili, Mumbai. The meeting was arranged according to the will of the Sisters and brothers who were speaking as prophets in this place. During that time Bro.Godwin and the ministry suffered tough times. Because of this meeting many people turned against him. I did not attend this meeting since I had just begun attending this ministry. During that meeting somebody lit a fire to the stage pandal. But I knew that the meeting which took place, was not our Lord’s will. After this meeting the ministry started sinking and the good Lord started raising His holy voice out of my mouth. He began to lift His ministry up. He started speaking out loud His Words through me. Since that day to this very day in the year 2001, the Lord God has continued speaking His words through my mouth.Because of the failure of this meeting, many people started to leave this ministry. The people confirmed to themselves that the Lord was not really speaking here. But the loving brothers and sisters did not understand that the Lord had chosen this place for His divine purpose. Because of the false prophecies, the people did not respect Bro.Godwin. But because this place was chosen by the Lord, the Holy Spirit openly started speaking His words through me and He started lifting this sinking ministry.One of the problems which the ministry suffered, was a court case. A case was filed against this ministry by some brother. But the good Lord was guiding us what exactly to do. Every detail about where to go, what to do and how to do, was revealed through me by the Holy Spirit of the Lord. As the Lord had spoken and revealed through me, in the same manner the brother withdrew the court case.As a custom there would be prayers in the church at 4:30 p.m. for all the prayer requests. Some brothers and Sisters would gather for prayer. At that time one particular Sister started seeing some false visions. She said that she saw a world map and a snake covering this world map. But as revealed by the Holy Spirit I understood that this was a wrong vision. After some time she also stopped coming to the church. Today she is no more in this ministry. Likewise, many people began to see false visions and false prophecy in the name of the Lord. But because of the presence of the Lord, He did not allow this to continue in His holy place. Many warfares with the evil one were encountered by the church. But because of the Holy Spirit speaking and revealing hidden things through me, the Lord Jesus Christ started giving victory in all the spiritual battles that were encountered. Hallelujah ! During that time, Bro. Godwin was ordained as a Pastor and accordingly he applied for the registration of the church. Previously, whomever he relied on, all of them tried to stop this registration from happening. But the good Lord spoke through me saying, “Apply again and I will give you victory.” In the same way Bro.Godwin did it. And miraculously in a very short time we received the church license. After beginning this church, the Lord started correcting His people. As some feared the Lord, they believed and accepted the words that the Lord spoke through me. But on the other hand many disbelieved and started going in their own ways. The few people who believed are here even today, and the Lord has blessed them in their lives. But the people who did not believe all went astray. Who can go against the Lord’s will. Today all the church members walk in fear according to the will of the Lord. Many marriages, dedications and a couple of funerals have taken place through the church. Even my daughter Padma was married to a good life partner whom the Lord had showed. Many proposals came, but according to the Lord’s will she was married to the boy of God’s choice. Today she is living a happy life with her husband and a three year old boy. They are members of the Star of Bethlehem Church. The Lord added more members.But I would like to mention about the marriage of Bro.John, which was held in the Star of Bethlehem Church. This marriage was according to the will of the Holy Father. The Lord showed him the girl and he willingly agreed and so did the girl. The marriage took place. But as I explained earlier that nobody likes to accept the correction of the Lord. Rejecting the correction of the Lord, many people started speaking against this church. All lies ! I did not fear anything because I was sure in my heart that this marriage was the will of the Holy Father and not my own. The marriage took place with both sides knowing and agreeing that it was the Lord’s will. But our good Lord always spoke to Bro.John saying, ” I know how to bring her.” The Lord many times repeated the same words. Bro.John believed in the Lord and patiently waited for the fulfillment of God’s Word. In the same way she returned back through Bro.John Rabindranath, to the same Star of Bethlehem Church. Today, Bro.John is a father of a child through her. But I believe the same Lord will do the work once again. I know Bro.John will wait for this. At present our church remains in a transformed state. First of all there is holiness in the church. The Lord always speaks to us in love and in authority. Whenever, He speaks in authority, we are all very happy because He brings us out of this worldly sin. 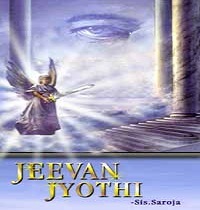 We can then have this ‘Jeevan Jyothi” which means light of life. Our Lord Jesus Christ is the light of the world. Whenever you read this book, learn to give first place to the Lord, then He will give everything to you as He has given me. Once again dear brothers and Sisters, the evil one tried to attack me through my husband. Whenever I would return from any house meetings, my husband would not open the door. And nearly after half an hour after knocking and calling out his name, he would open the door at his own leisure. On some occasions, hearing the noise, the neighbours used to come out and watch this commotion. It was quite shameful for me, but my good Lord gave me patience to wait and keep knocking till he opened the door. Then one day, he did not open the door for nearly two hours. And finally when he did decide to open, he told me that I had no place in his house and that I should get out of this house. He said, “You decide at this very moment, whether you want me or your Lord.” As I had already made up my mind that the Lord is my first priority, I took a big step in my life. I decided to leave my house and stay in my daughter’s house, which by God’s grace was near to my house.Then the next day, my husband went to Pastor’s house and started complaining about me and told him many things that were not true and unthinkable. Some of the things are that I was not a good lady, that I did not go to the Hindu temple nor attend any Hindu functions or marriages with him neither do I put a ‘tikka’ on my forehead and that I do not take care of my family. He told Pastor to advise me not to come to this ministry. But Pastor did not listen, as he knows the truth which is spoken through me by the Lord Jesus and he knew that no one could stop me from coming. He said to him that my church is open and that whoever has spoken against her or against the Spirit in her is not alive or has lost their peace. He said if you want to try, you try and stop her. But I will not do that. Then he grew very wild on Pastor and started shouting and saying things like; I will give a police complain against this church and say that they are forcibly taking my wife into their fold. But Pastor told him to go ahead and do whatever he wishes to. Then as the Lord promised time and again saying. “I will fight your battle. You only stand on my word.” The Lord proved it when the very next day my husband came to my daughter’s house where I was staying, and agreed that I could continue serving the Lord and he would not be a hindrance for the same. But I should only come back. I thank God for such a change in him. My dear brothers and Sisters, when you follow the Lord, follow Him fully, because many trials and tribulations will come in your way and the Lord will also test you. But remember, finally God will give you the victory. I would also like to add here that, when I walked out of my house, I had nothing with me. No money, no clothes, but I did not worry for anything as the Lord’s peace was with me and that was the only thing I wanted. The Lord provided me with everything; clothes, money, food through Sis.Janet Amin and Pastor’s family. As it says in Mat. 19:29, “And every one that hath forsaken houses, or brethren, or Sisters, or father, or mother, or wife, or children, or lands, for my name’s sake, shall receive an hundredfold, and shall inherit everlasting life.” He proved this in my life according to this Word. After passing this test, which the Lord had set for me, the Lord fulfilled my wish of visiting Israel in a miraculous way. One day the Lords Spirit put a thought in my heart that it was time, we should visit the Holy land. At the same moment without our knowledge, a brother staying in Abu Dhabi had put a request before the Lord, that he wanted to sponsor a visit to the Holy Land for the Lord’s servants. Accordingly, Pastor, Sis. Ida, Sis. Janet Amin and myself along with this brother visited the Holy place without spending a single rupee from my side. i.e. the to and fro ticket expenses, hotel expenses, etc. I was so happy because my Lord fulfilled my dream very soon. “Yea, a sword shall pierce through thy own soul also, that the thoughts of many hearts may be revealed”. The same pain was seen on her face. When we see our mothers love for us through Jesus, we cannot stop praising Him. In the same way, those who will carry His burden, those who will bear His sorrow and those who share willingly, will definitely be blessed and have His grace and mercy upon them. So dear brothers and sisters, let us learn to carry His cross willingly and be blessed. Before we loved Him, he had formed us in our mother’s womb and loved us. Jesus died for our sins on the cross and showed us how much He loves us. He expects us also to love Him in the same way in which He loves us. He asked Peter not once but thrice, “Peter do you love me ?” To the Ephesian church, as mentioned in Rev 2:4, Jesus says that your Love has now reduced. Lev 11:44-45Therefore if you are holy, you will be strong in Spirit and challenge the evil one. You will also be able to pray strongly, but without holiness in our lives no man can see the Lord.”Follow peace with all men, and holiness, without which no man shall see the Lord”. Heb 12:14″O worship the LORD in the beauty of holiness: fear before him, all the earth.” Ps 96:9. Children of God, if you are holy the Lord will dwell in you and work through you many miracles. Therefore, from today let us learn to walk, talk, see and hear in holiness. When Jesus will come again, He will only take with Him people who have obeyed and kept His commandments. But the time that He will come, we do not know. So let us correct ourselves from today and begin to lead holy lives. Dear brothers and sisters, the Lord always loves humble people. The Lord has mercy only on humble people.”Surely he scorneth the scorners: but he giveth grace unto the lowly.” Prov 3:34″But he giveth more grace. Wherefore he saith, God resisteth the proud, but giveth grace unto the humble” James 4:6″For whosoever exalteth himself shall be abased; and he that humbleth himself shall be exalted.” Luke 14:11.We should learn to be humble before the Lord and His servants and the Lord will bless and lift us mightily.”An hypocrite with his mouth destroyeth his neighbour: but through knowledge shall the just be delivered” Prov 11:9. If the Lord has already blessed you with these gifts, you should keep praying all the more so that He will renew it. Even in the Old Testament, Moses, Elijah and Elisha, the holy prophets, did mighty miracles through the Holy Spirit. In the same way in the New Testament, Peter and Paul brought a revolution through the gifts of the Holy Spirit. The Lord will bless you with the same gifts as He is not a partial God. You will be filled with the fruit of the Holy Spirit, if you surrender yourself and your life fully in the hands of our Lord Jesus Christ. People will see Christ’s love in you and God’s name will be glorified through you. May the Lord Jesus Christ bless you. When we were planning to go to Chennai, I remember one incident which dear brothers and sisters, I would like to share with you. About 3 years back we received a letter from Bro. Paul Dhinakaran, saying that a brother and sister are arriving from Mauritius and before coming to meet them at Chennai they will be staying for a week in Mumbai. He also said that when he was praying the Lord showed him two Churches in Mumbai and one of them was the Star of Bethlehem Church. He requested us to take care of them.When we were praying about these visitors I got the following verse,”And he said unto him, Behold now, there is in this city a man of God, and he is an honourable man; all that he saith cometh surely to pass: now let us go thither; peradventure he can shew us our way that we should go.”1 Samuel 9:6. As I read this verse, I perceived that this brother and sister had come to see the Lord’s servant for some specific work. So we gladly received them in our Ministry. Then the visitors came to Mumbai and were staying with us at Star of Bethlehem. Mrs. Khedoo gave the message in the Saturday healing service, as she was a Pastor in Mauritius. After the service, when we were sitting in a group and praying she wanted to test the Holy Spirit in me. I did not know whether knowingly or unknowingly. She came to me and told me that we will pray together, and as I joined my hands together, she held both my hands in her hands and began to pray. As usual, the Holy Spirit started filling me. She suddenly separated both my hands with her hands, but I was still full with the anointing. After that, she lifted my hands, but I was yet full with the Holy Spirit. Then suddenly, I realised that she was testing me and then I prayed to my Lord saying, “O Lord I do not understand what is happening, but let your will be done. You know my heart and this sister’s heart.” Then suddenly I was filled more than double portion and her hands were flung away from me. Then she realised that she failed, she just kept quiet and praised the Lord. After this incident, they tried a lot to contact Bro. D G S Dhinakaran but could not get either him nor Bro. Paul Dhinakaran on the phone. They had to finally go back to Mauritius without meeting Bro. D G S Dhinakaran. On the day of their leaving, Mrs. Khedoo had severe stomach pain and she lost her peace. I believe that the Lord tested them whether they were worthy to meet the Lord’s mighty servant. But ended up testing the Holy Spirit of God within me, for which the Lord was not happy. After reaching Mauritus, they wrote to us and they still do keep in touch. I believe after reading this book they will realise that Lord has forgiven them and the Lord will bless them. Dear brothers and sisters, Bro. D G S Dhinakaran is no stranger and is well known to all believers. My wish and heart’s desire was that I wanted to meet him atleast once in my life. I never expected that my good God would fulfill it so soon. I wanted to confirm that the Spirit speaking through me is true, because many doubted and were against me and this Ministry. As already written in the Bible in Mathew 10:18-22. “And ye shall be brought before governors and kings for my sake, for a testimony against them and the Gentiles. But when they deliver you up, take no thought how or what ye shall speak: for it shall be given you in that same hour what ye shall speak. For it is not ye that speak, but the Spirit of your Father which speaketh in you. And the brother shall deliver up the brother to death, and the father the child: and the children shall rise up against their parents, and cause them to be put to death. And ye shall be hated of all men for my name’s sake: but he that endureth to the end shall be saved”. I was well aware of these verses but as being human I still wanted confirmation and wanted to meet Bro. D G S Dhinakaran. The same Lord spoke through Bro. D G S Dhinakaran and he prophesied that whatever the Lord has promised through Sis. Rovina Nander, Sis. Shalaka Salins including myself were true. He also prophesied many things for me, Pastor and for the Church and many things have already come to pass in mine and Pastor’s life and the Church.I had given a testimony in the Church’s newsletter which I am sure all have already read. But I would like to share it once again which is as follows:”And whatever you shall ask in my name, that will I do that the Father may be glorified in the Son.” John 14:13According to the above verse, the Lord Jesus promises us that whatever we ask in his name the Father will grant it to us. In verse 15, He also says that if we love him we must keep His commandments. And He goes on to say in verse 16, that if we keep His commandment, He promises to give the Holy Spirit to guide us. Through the Holy Spirit we can overcome all tribulations of this world. The Holy Spirit of God will guide us through every way.I want to explain this to you, with some recent experiences in my life. About 2 months back, I had the desire to meet Bro. D G S Dhinakaran we kept this matter in prayer, the gracious Lord opened the way and we spent over an hour with him at Chennai. He spoke many things to us, by the power of the Lord’s Holy Spirit. God answered every prayer that we had made in the name of the Lord Jesus Christ.But, my dear brothers and sisters before we could get this blessing of meeting the Lord’s servant, the devil began to devise his evil plans. On our journey from Mumbai to Chennai, the airplane shook vigorously for atleast 10 minutes. I perceived that the evil one wanted to scare us and lessen our faith. Then I prayed to the Holy Father in the name of the Lord Jesus and He answered my prayer according to John 14:14. “If ye shall ask anything in my name, I will do it.” We reached Chennai safely.We were very happy the night after we met Bro. D G S. With great rejoicing in my heart, I spoke to the children at the Star of Bethlehem Church and shared my happy experience on the phone with great joy. The very next day I got a phone call from Mumbai from my daughter Padma, who was 6 months pregnant. She began to have some problem and called me up crying on the phone. Once again, through the Holy Ghost, I immediately perceived that this was the devil’s work. The devil is never happy when we are happy. I assured her not to worry and that I would pray for her. I also remembered all that the Lord prophesied through Bro. D G S concerning my family. Then I prayed in the name of Jesus to the Father and then called up my daughter. She replied that the bleeding had stopped but there was no movement of the child in her womb. I yet persisted in prayer to the Father in the name of Jesus Christ and claimed all the words of prophesy and also the work written in Deut 28:4 “Blessed shall be the fruit of thy body…” After this I called Mumbai for the third time at night and asked my daughter about her health. She replied that she was completely well. Praise the Lord!From this experience, we should be aware that whenever we get blessings, the evil enemy will always try to discourage us. Once again, affirmatively I tell you that, whatever you ask in Jesus’ name, the Father will surely answer you.Many spoke against the Star of Bethlehem Church saying that evil spirit was speaking here. Today I am proud in the Lord that I met Bro. D G S and through him it was confirmed that the Holy Spirit who is within me, is true. As the word of God says that all manner of sin and blasphemy shall be forgiven men, but whoever speaks against the Holy Ghost shall never be forgiven neither in this world neither in the world to come. Many who spoke against the Holy Spirit within me, are no more in this world and some are still living in total unpeace.Whereas, we in the Star of Bethlehem Church are very happy in the Lord and every church member is blessed with his Love. Whenever we pray for any Church member, the faithful Holy Spirit is always ready to guide us and answer us by speaking to us. I thank the Lord, that since 6 years he has been using me as His prophetess in this Church. By my own, I am nothing, but in the Lord I can do all things. I give the Lord Jesus all the glory and praise. I pray that the Holy Spirit be with you and the Holy Father answer every prayer that you make in the matchless name of the Lord Jesus Christ. Pastor and myself had thought to ourselves that once all the Christmas programmes were over we should try and go on a holiday as we wished to renew ourselves before the New Year. This was kept in prayer only between Pastor and me. Then suddenly the next day, a particular Sister said she would like to give Pastor’s family and my family a Christmas gift by sponsoring our trip to Khandala. I was surprised and happy how my Lord had put the thought in that Sister’s heart so soon and granted us our wish. I pray and thank that brother and sister for giving us such a wonderful holiday. I believe the Lord will bless them and will always be with them. I therefore believe that if I give my full time to the Lord, the Lord will bless me according to his promise. I thank my Lord for using me and give full glory to him. On my return from Khandala, I got an unexpected gift a brand new Golden colour Zen Car. When I was asked about this gift, I prayed to the Lord whether to accept this gift or not. The Lord showed me Gen 14:22-23. According to this verse, I was not happy. So they explained to me if I do not accept it, the Lord will still help me in a different way. The Lord spoke through Shalaka “I will bless you my daughter”. I therefore give all glory to my Lord Jesus who is fulfilling my heart’s desire even before asking him. Dear Brothers and sisters, I would like to share a short message with you. Proverbs 21:2. The areas in our life that need to be corrected, Jesus will reveal to us. In Jesus’ hand there is a mighty weighing scale, in which he will weigh all our thoughts and judgement will be given accordingly. In Daniel 5:27,28, we read that the king of Babylon was weighed in the balance and was found guilty. And in verse 30, the king was murdered and he did not see the next day. Before going to the scale, we have the mercy of the Lord Jesus Christ today. Therefore, from today let us check ourselves.According to this verse, one day suddenly, the Lord’s scale came on Miriam’s life for every account of the word she spoke against Moses. The Lord questioned her as to, “Why did you not have any fear before speaking against my servant? And the anger of the Lord was kindled and behold Miriam became leprous white as snow.” Numbers 12:8,10. Dear brothers and sisters, be careful before speaking any unwanted words from your mouth, because you have to give account for every loose word you speak against the children of God. One should be like the Psalmist, who asks the Lord to search and find him, and to cleanse his thoughts. Ask the Lord to make you to walk in righteousness and pray steadfastly to the Lord. Ps 19:13.”Keep back thy servant also from presumptuous sins; let them not have dominion over me: then shall I be upright, and I shall be innocent from the great transgression.”I would like to mention another thing here. All the Church members know Zubin Salins, Pastor Godwin Salins son. In Zubin’s life, the Lord had promised many mighty things. Some years back in a vision, the Lord gave me a particular verse “Jesus wept” John 11:35, both for Zubin and Roshan to share in the Church. I wondered why the same verse was given for both of them. Today, all have heard a part of Zubin’s testimony, but inside stories are many. I believed Zubin and he hurt not only me, but also his father who had full faith in him. I have already written earlier, that many had given false visions in Star of Bethlehem Church and he is one of them. Finally, Zubin made up his mind to make the children of God separate because he could not cheat his father. How the Lord corrects other Church members, the same way the Lord corrected him many times and asked him not to give false visions. Whatever is written in the book of Leviticus and what a man should not do, he did most of the things in hiding. When the truth was revealed, he started saying that whatever the Lord revealed was lies. Because of this, he took a lot of beating from the Lord and ran out of the Church. In his life, whatever the Lord promised was delayed because of the countless sins and false visions. Today, once again we are praying for our merciful Lord to forgive him as he has accepted all his mistakes and come back. Now I understand the meaning of the verse, which the Lord gave a few years back for Zubin and Roshan to preach. I have given Zubin’s example especially as a message for the youth of our Church. Therefore, my dear children, do not fall into the same sin as Zubin and do not speak against the servants of the Lord because everything is open before the Lord and He will bring everything to light. Today dear brothers and sisters, in our Star of Bethlehem Church, many sisters and brothers are being used as the Lord’s mouthpiece because of this, Pastor and I are very happy. We believe that in the coming days as we worship our Lord in one heart and mind, the Lord will abundantly bless us. After reading this book, I am sure you will decide and give the Lord Jesus Christ, His rightful place in your life and walk according to His commandments without thinking twice what people will talk about your belief and life. One should carry the cross in the same way and obey God, as Jesus obeyed His Father’s will.Therefore dear brothers and sisters, let us check our lives today and try and know, what the Lord’s will is in our lives as the Lord is coming very soon. I would like to share a particular verse here, which the Lord revealed when I was praying how to conclude this book. According to this verse, we all know what is the present situation in Israel and I believe that the end is coming soon. The abomination, that is the heathen temple, which is now in the grip of the Palestinians, will soon be removed and the Lord will shed blood out of their mouth and the Lord’s temple will remain there. This is the sign of the coming of our Lord Jesus Christ. Whatever is written in the Holy Scriptures will surely come to pass. Therefore, I pray that each one repents and prays to our Lord Jesus Christ for his or her own salvation. Praise the Lord and may the Lord bless you.